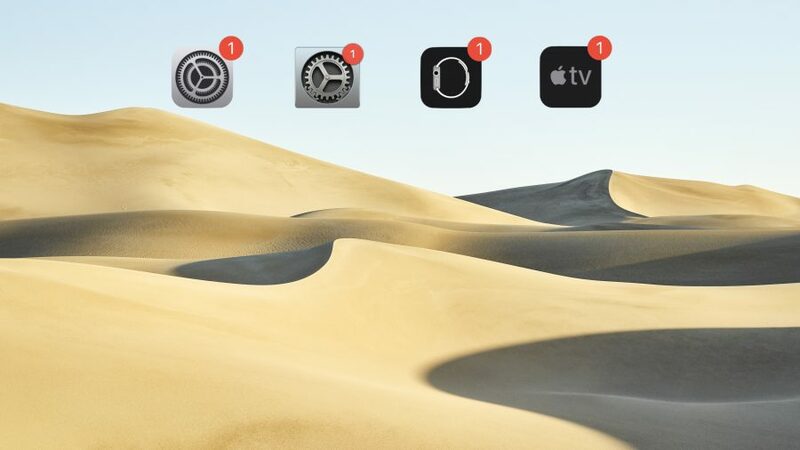 Apple has released iOS 12.1.3, macOS 10.14.3, watchOS 5.1.3, and tvOS 12.1.2. What’s in them? Apart from security fixes, not much, if you go by Apple’s release notes. As always, we encourage waiting a few days to install these updates, in case any issues crop up. Don’t expect any fireworks or new features from the iOS 12.1.3 update, just a collection of minor bug fixes. 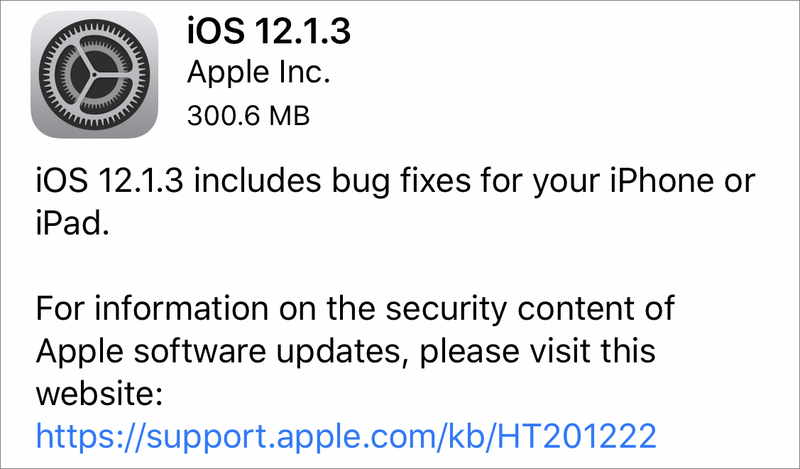 The iOS 12.1.3 update is 228.1 MB on the 10.5-inch iPad Pro and 300.6 MB on the iPhone X, and you can obtain it in Settings > General > Software Update or install it through iTunes. By default, the HomePod will install iOS 12.1.3 automatically, but you can disable automatic updates and install manually if you prefer. In the Home app on the iPhone, tap the house button in the upper-left corner, and under Speakers, tap Software Update. 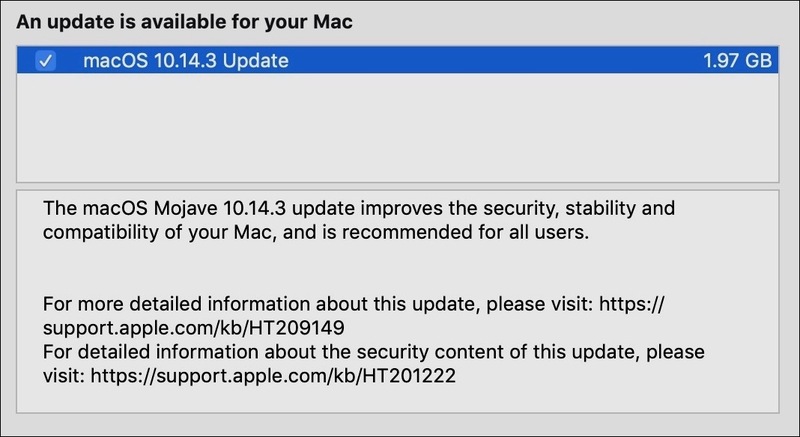 The macOS Mojave 10.14.3 update is even more of a nothingburger than iOS 12.1.3. Despite the lack of notable new features, the update is still 1.97 GB, and you can install it from the Software Update pane of System Preferences. Alternatively, Apple offers combo (2.49 GB) and delta (1.99 GB) stand-alone updaters, but as reader Al Varnell pointed out in the comments, the combo update has an error that prevents it from installing. Stick to Software Update or the delta updater. 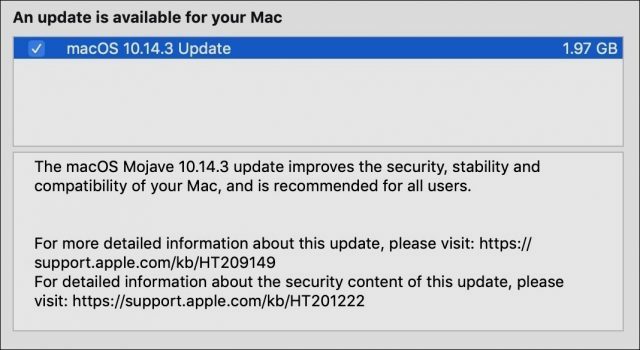 The macOS 10.14.3 update includes 20 security fixes. watchOS 5.1.3 takes the award for the shortest release notes of this batch of updates with a grand total of seven words: “This update includes improvements and bug fixes.” The update also includes 13 security fixes. You can install the 62.3 MB watchOS 5.1.3 update using the iPhone’s Watch app (go to Watch > General > Software Update). The slackers in charge of the release notes for tvOS 12.1.2 clearly just phoned in their work, sticking with the traditional eight words: “This update includes general performance and stability improvements.” The update also offers 17 security fixes. If automatic updates aren’t on, you can update your fourth-generation Apple TV or Apple TV 4K by going to Settings > System > Software Updates. I know we should do security updates, but the last two iOS updates only mentioned fixing issues with the new phones, so I didn’t do them. I have an SE. I’m always afraid of it slowing down or losing battery life from an update. I’m always afraid of it slowing down or losing battery life from an update. I’ve not heard of that being a concern for point releases, only major releases. iOS 12.1.2 didn’t have one but 12.1.3 has a lengthy list of security content, including multiple vulnerabilities exploitable through a browser and in the kernel. Thanks, I don’t think it’s shown up in my phone yet (the update) so I haven’t read the list. And you’re right, it does seem to be the major releases that cause problems. The older my phone gets, the more worried I get about upgrades! I have that same concern. And even if we believe point updates don’t introduce slow down, we know that they every once in a while raise havoc by introducing new bugs despite Apple’s testing and all the betas and public betas and yada yada. I’m very reluctant with these updates. As Curtis points out, this one does offer security fixes and I want to take that seriously. But I’ll wait at least a week or two so that if it’s a buggy update I won’t be affected. Bottom line, I have lost (at least some) faith in Apple’s QA/QC. Is there any special significance to the rotating terms used here? No, just trying to avoid repeating one word over and over again.